Fresh mozzarella and tomatoes are layered on pesto-grilled zucchini for a fresh summer spin on traditional Caprese salad! Preheat indoor grill pan or outdoor grill. Slice zucchini at an angle into 1/4-inch slices. Brush or toss lightly in olive oil and sprinkle both sides lightly with salt and pepper. Lay zucchini in a single layer on grill and cook for a few minutes on each side until grill marks appear and zucchini is slightly tender. Remove from grill and place on serving plate. Spread a light layer of pesto on each slice. Layer cheese on top, followed by tomatoes. Sprinkle with kosher salt and black pepper. 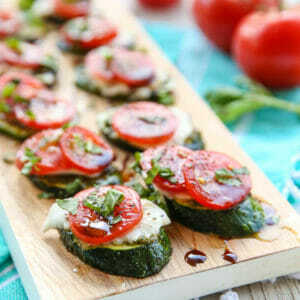 Drizzle with olive oil and vinegar and then sprinkle basil on top as desired. Serve warm, room temp, or chilled. Measurements are obviously approximate. Just eyeball it- you get the drill!